The holidays brings on some pretty darling fashions. From Pjs, to play wear to holiday apparel for photos and parties. You are sure to find holiday fashions for any occasion. Not only can you find it all at Carter’s but the fashions are most definitely affordable. 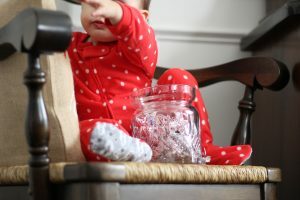 Carter’s has some pretty awesome prices and the you can pretty much always count on an amazing sale or coupon code to help stretch your money a little farther. 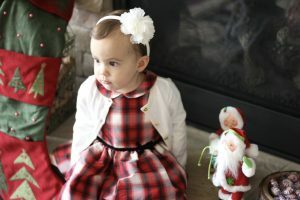 How sweet is little Izzy in her holiday dress with this little sweater tucked under the peter pan collar. Isn’t this such a perfect and elegant look for a special holiday family photo or get together with family? 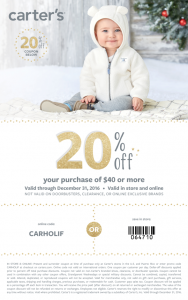 Carter’s will be having Black Friday deals that you don’t want to miss! They are also offering a “Dash In to Win” sweepstakes that will award promo cards to the first 100 people to arrive at their local Carter’s or OshKosh store! Isn’t that a pretty amazing deal? The Dash In to Win Sweepstakes will be held on Black Friday (11/24 – 11/25) This depends on whether or not the store is open on Thanksgiving. Be sure to check the store locator to confirm what date the sweepstakes will be held at your nearest location. 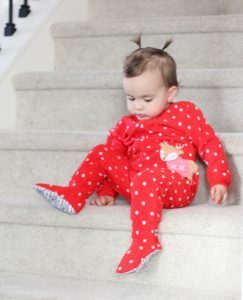 How darling are these girl pajamas from Carter’s? They have some pretty cute boy pajamas too! These fleece pjs are comfy and cute! Snag your holiday fashions with this coupon code! So cute Izzy!! Love your style little miss fashionista! 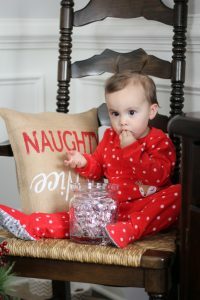 Carter’s jammies are a must have for Christmas! I love carters! I hope that the dash sale is in Louisville! Oh girl! Me too! It will be so fun! I am a fan of Carter’s. Izzy is rocking those pj’s! She is a doll! Izzy is so adorable! 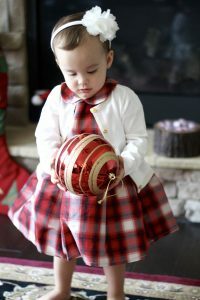 She is totally ready for Christmas too, so cute! So much cuteness! I can’t even deal!!!! We love Carters! She is so cute. I LOVE all of her outfits!!!!! 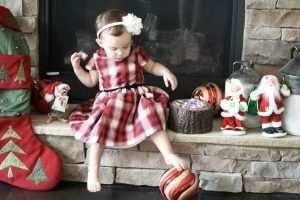 Carters has adorable holiday clothing! She looks amazing!!! Carter’s has the best holiday outfits! We love their dresses! Thank you! They have darling stuff! We are so a Carter’s family! My E has those p’s! Yay! The pjs are so soft! Carters is my favorite place for pajamas and basics! I always look forward to their holiday clothes! Me too! They have some darling pieces! Izzy looks so cute in these photos!!! Carter’s is one of my favorite places to shop for my kids! Thank you! Yes us too! Such a super cutie in all those outfits! I did destructive Black Friday shopping with carter’s online on Friday and Monday morning. Seriously my fav store since day 1. Wouldn’t have it any other way. Haha! I love it! Go mama!